Hawai‘i Volcano Watch: Did Aerial Bombing Stop the 1935 Mauna Loa Lava Flow? 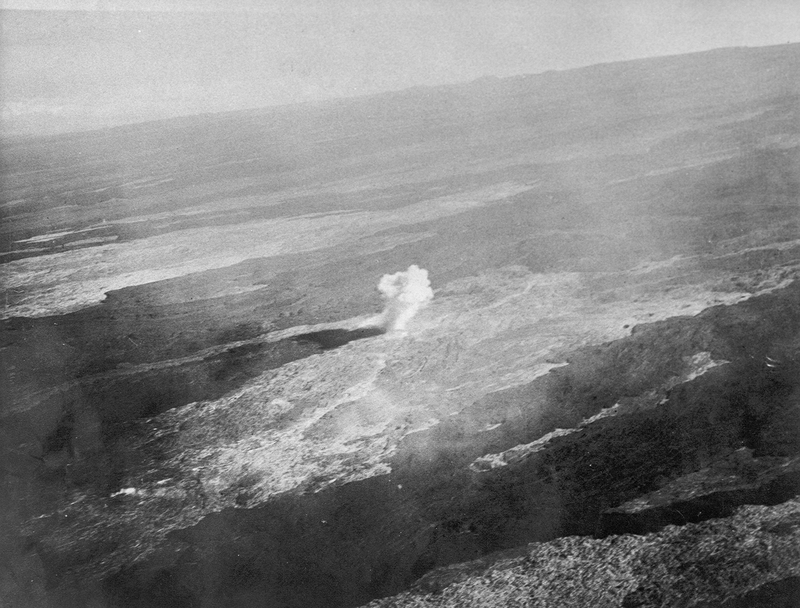 Aerial view of a bomb detonating on Mauna Loa near the 8,500-foot elevation source of the 1935 lava flow on the morning of Dec. 27, 1935. This was one of twenty 600-pound bombs dropped on the lava flow that morning by the Army Bombing Squadron from Luke Field, O‘ahu. Photo by Army Air Corps, 11th Photo Section. The eruption in question began on Nov. 21, 1935. Six days later, an unusual breakout at an elevation of 8,500 feet on the north flank of Mauna Loa sent ʻaʻā lava to the north. Pāhoehoe lava ponded at the base of Mauna Kea for two weeks before advancing toward Hilo at a rate of about one mile per day. On Dec. 23, fearing that the flow would reach the headwaters of the Wailuku River, which supplied water for the town of Hilo, Jaggar called on the Army Air Service, based on Oʻahu, to bomb the lava flow source. His hope was that the lava tubes or channels could be destroyed, thereby robbing the advancing flow while feeding another flow that would re-cover the same area. The flow was bombed on Dec. 27, and lava stopped flowing during the night or early morning of Jan. 2, 1936. Jaggar publicly praised the Army for its responsiveness and technical accuracy in delivering the bombs to his selected targets. In turn, Jaggar was praised for his successful experiment and for saving Hilo. What is not widely known is that a USGS geologist, Harold Stearns, was on board the last plane to deliver bombs to Jaggar’s targeted areas. Stearns had been mapping the geology and water resources of Maui volcanoes. But when he heard about the plan to bomb the lava flow on Mauna Loa, he traveled to Hilo to see if he could fly with the Army. Stearns got his chance. At 12:40 p.m. on Dec. 27, his plane dropped two 600-pound bombs (each with 300 pounds of TNT), but they landed a few hundred feet from their target. Jaggar himself watched the bombing through a telescope from the base of Mauna Kea. Following up with a letter to Jaggar in January 1936, Stearns questioned the effectiveness of the bombing. Jaggar’s boss at the time, Hawai‘i National Park Superintendent E.G. Wingate, was also skeptical. Modern thinking mostly supports Stearns’ conclusion. Whether or not the bombing stopped the 1935 Mauna Loa lava flow remains a controversial topic today. Volcano Watch is a weekly article written by U.S. Geological Survey’s Hawaiian Volcano Observatory scientists and colleagues.